CHS Helping Hands, Key Club, and FCCLA are pleased to bring to a BREAKFAST WITH SANTA event to CHS this holiday season. 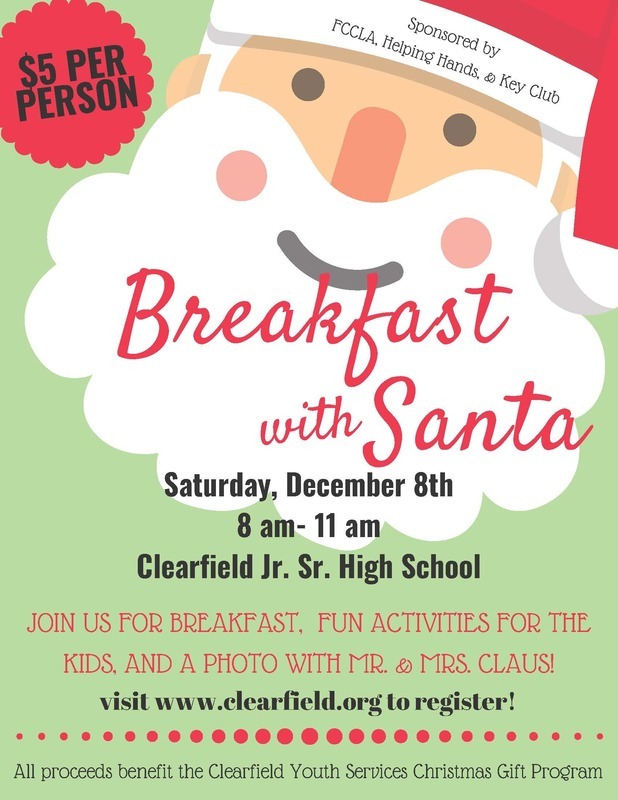 Breakfast with Santa will take place on Saturday, December 8th at Clearfield Area Junior Senior High School. These service clubs have planned a morning full of games, crafts, activities, food, and of course a photo opportunity with Mr. and Mrs. Claus! All proceeds will benefit the Clearfield Youth Services Christmas Gift Program. REGISTRATION IS LIMITED! Be sure to register TODAY, so you don’t miss out on the fun. If you cannot attend the event, but would like to make a donation, please contact Mrs. Borden at CAJSHS or a club member.